Just got back from my trip to Seoul, south korea last week. It was one amazing trip! 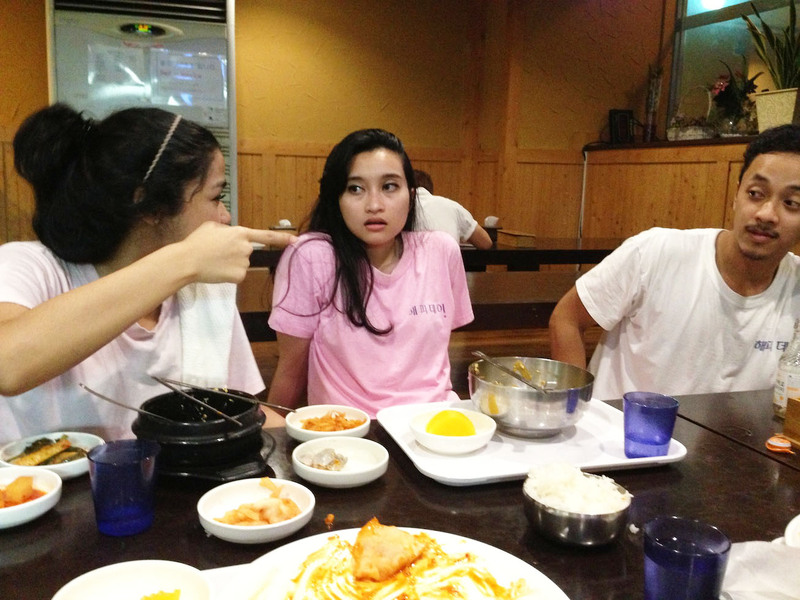 Actually, i was there to participate in model united nations of seoul. The debate was only 3 days, but we stayed in Seoul for 8 days, so we have 5 days to go anywhere we wanted. I was so thrilled that the MUN was held in Seoul. I’ve been to Korea once, but i was with a group tour back then, so it wasn’t much fun, but because this time we’re traveling by ourselves, so i was even more excited!!! a few weeks before i went to Seoul I already wrote a few places that i wanted to go and a few things that i wanted to try. 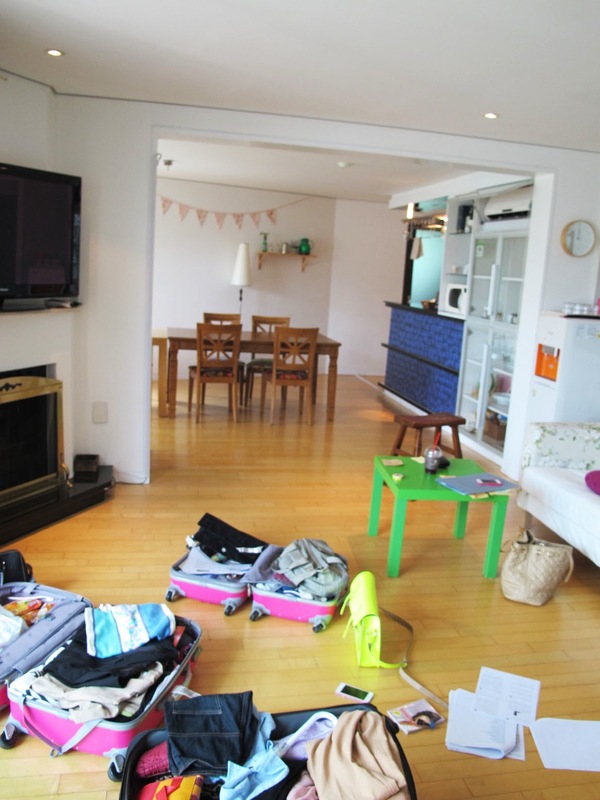 Here are some places that i went, some tips and some of my stories from the journey..
We stayed at this place called the pj house, located in Itaewon (one of the hippest districts in Seoul) we found out about this place from airbnb.com. It was an apartment, with 4 bedrooms and 2 bathrooms. Has its own kitchen and balcony, the tv was HUGE, the house is comfortable and clean, beautiful decoration, healthy and delicious breakfast was also provided. The wifi was fast and the host (Jyon) was so nice. Best place to stay when you’re traveling to Seoul! (Very recommended). The only bad thing about it is the subway station. The nearest subway station from this place is the Itaewon station, which we have to walk around 15 minutes to get there. So everyday by the time I reached the station i was already sweating bullet. but other that that, this place is Perfect! Actually, I’ve talked about this place in my previous post before. Myeongdong is like heaven for girls. Girls will go crazy here. Best shopping place in Seoul. 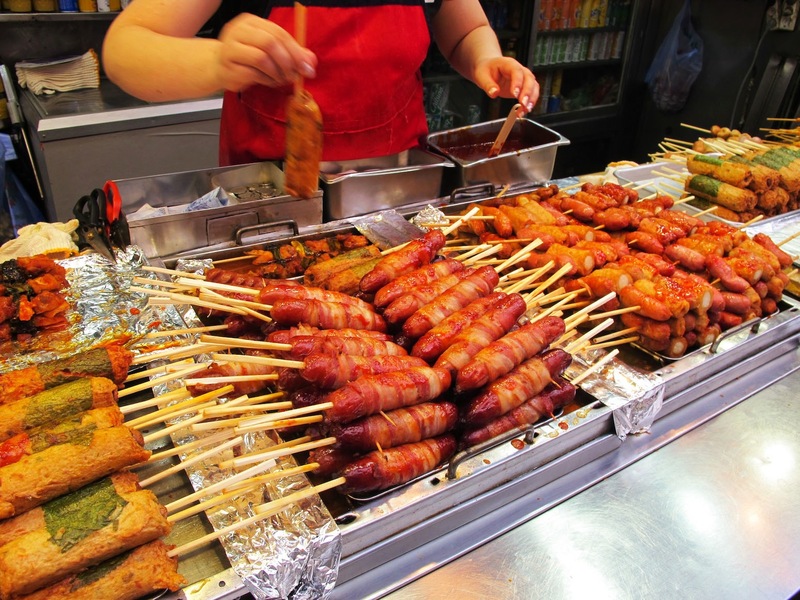 When i first came to myeongdong, the most exciting thing for me is the street food. Woaaahh! When i went there and saw those food vendors the first thing on my mind was “daeeebaakkk” (read: awesome) hahahaha. I’m a toppoki lover, i love korean street food, so myeongdong is definitely my kind of place. One thing that everyone wants to do while taking a break from shopping is to eat! Hidden within all of the marvelous shops are some really great restaurants. So many delicious looking food and it tasted awesome too. Besides food, my favorite part of Myeongdong is the cosmetic shops! everything was so cheap. I bought mischa’s bb cream for $11 there, and in Indonesia it costs around $35 (for the same product). So my advise, buy as many cosmetics as you want, cause if you don’t, when you come home you’ll regret it. So many interesting things to see there. And it was HUGE. So be careful when you go there, you might get lost. Hongdae is short for hongik daehakyo (hongik university). 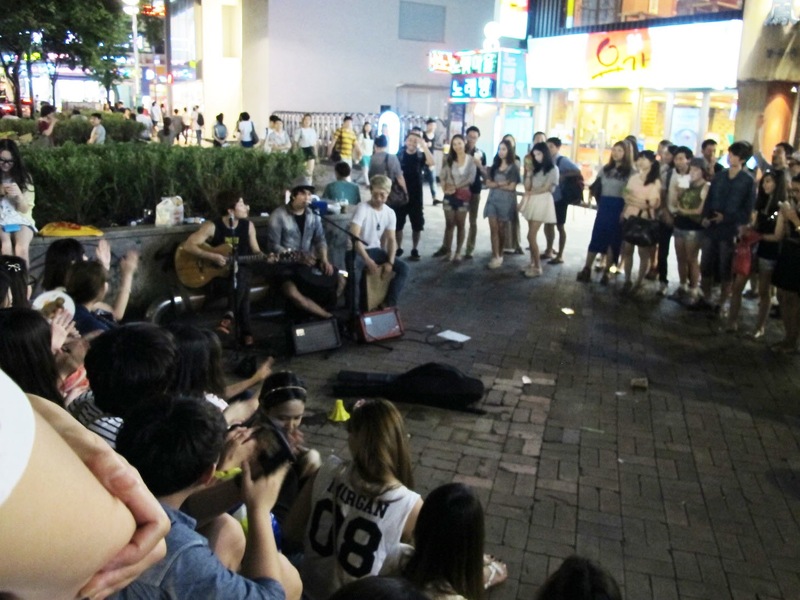 Hongdae is the city’s premiere young, funky, artsy university neighborhood. 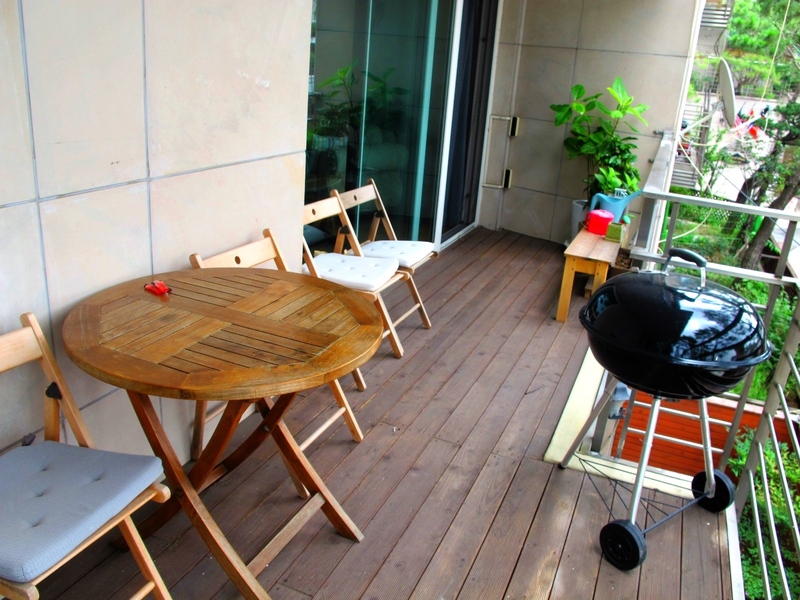 Located very close to hongik university. So if you’re traveling on a subway and you can’t see hongdae station on the map, that’s because the name of the station is hongik university station. So to get here, accessed via Hongik University Station line 2, exit 5. 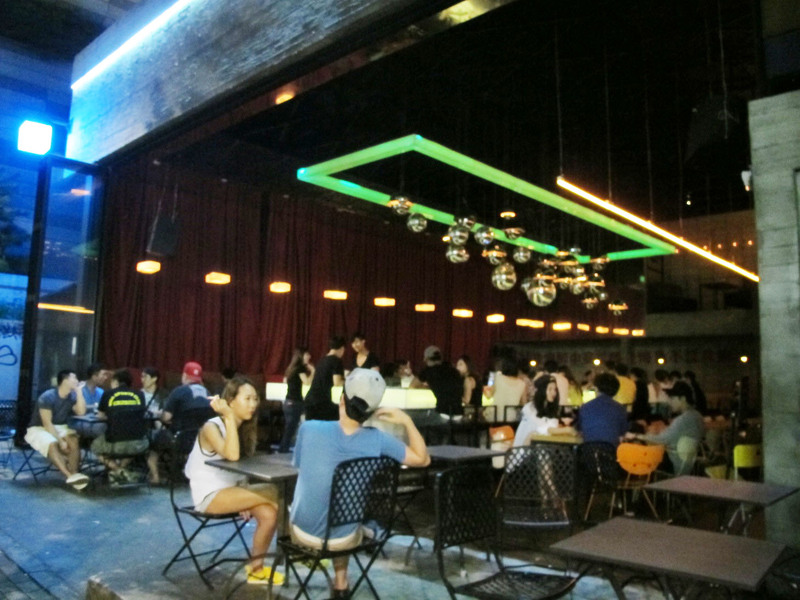 Hongdae is where the cool kids hang out. I’ve been here once before. But i didn’t see much. 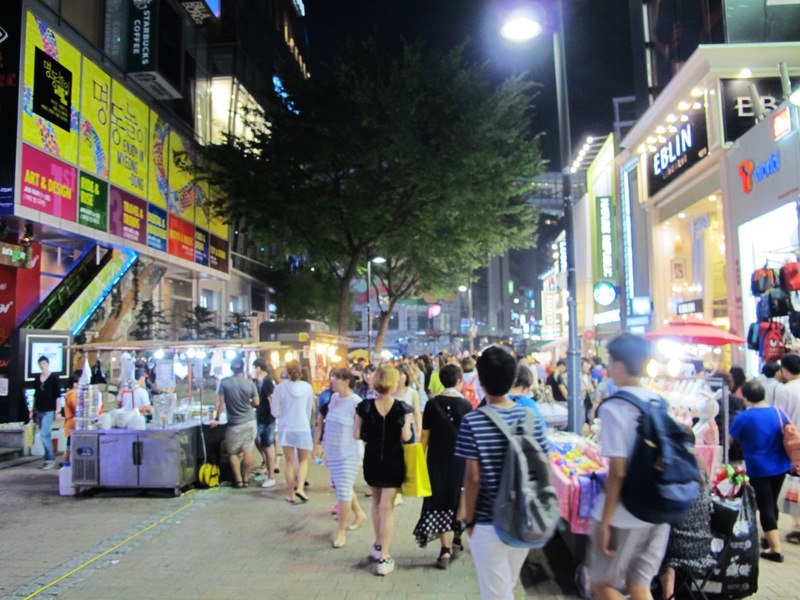 This time I explored everything in hongdae. 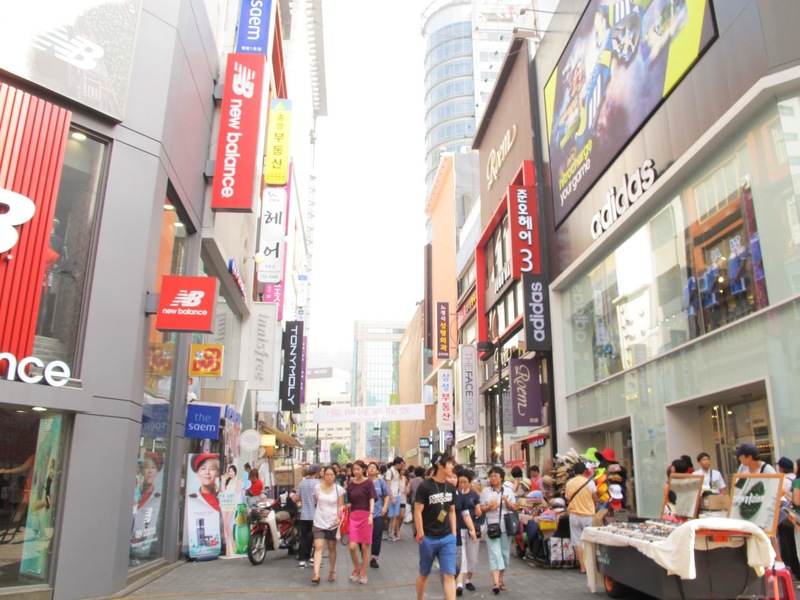 As usual, like many other streets in korea, this place has many clothing stores and restaurants. At night there are street artists who sings on the street or do other performances. I really like this street a lot, I can feel the ‘korean vibe’ here. Well anyway, this is a must visit place when you’re in Seoul. Oh! 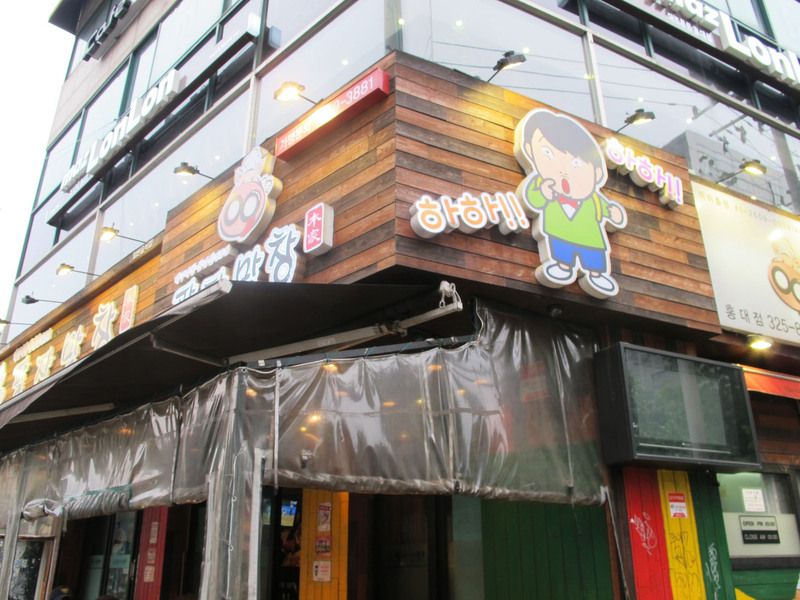 Almost forgot, if you’re a running man lover like me, you have to visit haha’s and gary’s restaurant in hongdae. People said that if you’re lucky you might see haha or gary here! 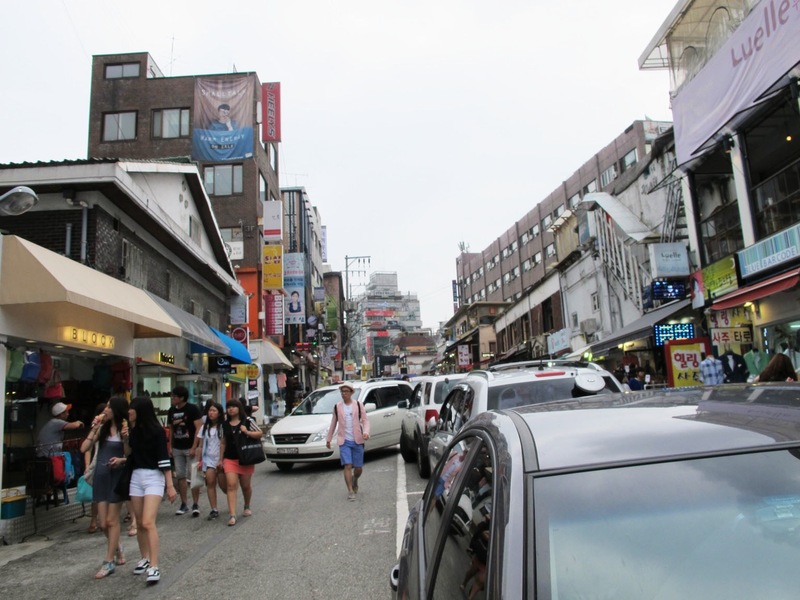 There is really so much more to Hongdae than what I’ve mentioned, such as dog cafes, narrow streets with over 50 women’s clothing boutiques and a huge concentration of great Korean restaurants. Hongdae is one of the best places in Seoul to explore, there’s always something new to see or do as it is constantly in flux. This is one of many places that i wanted to try the most. I saw this place in dramas and variety shows a lot. The last time i went to Korea, i wasn’t able to go to this place. So when i went to Seoul last week, I make sure I go. 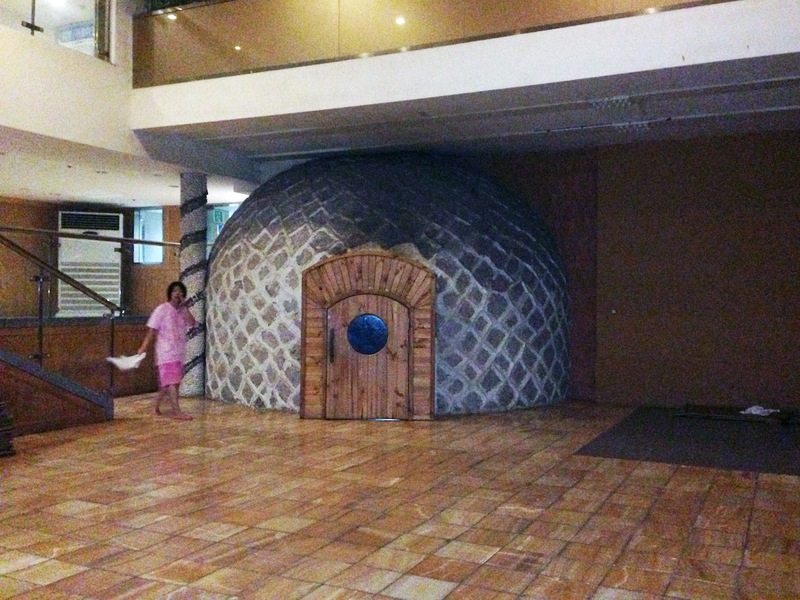 For you who don’t know what this place is, this is a korean sauna/spa place, this is the place in Korean dramas where people wear towels on their head and they walk around wearing identical clothes. Inside this place there are couples of rooms that are very hot, and some of the jimjilbang also has the “cold room” with lots of ice inside it. We can watch tv here, drink, eat, and even sleep up to 12 hours. We payed $9 for 12 hours. There’s also a jacuzzi inside the locker room. The jimjilbang that i went to was located in hongdae. the name was “happy..” something. i forgot. Lots of facilities available but I thought that this Jimjilbang seems a bit old and not crowded like what I imagined it’ll be. While you’re here you should try cracking eggs on other people’s heads like in running man. lol. If you go to Korea, this place is a must try, they don’t have this kind of place in other countries, only Korea. So try this at least once in your life. This is the highlight of my trip, lol. Okay, i admitted, i like Kpop, well i like most of their songs, but my favorite, my kpop god is BIGBANG! I love bigbang, i’m crazy about them. It is somehow embarrassing to admit this, but i love them too much to hide it. Hahaha. 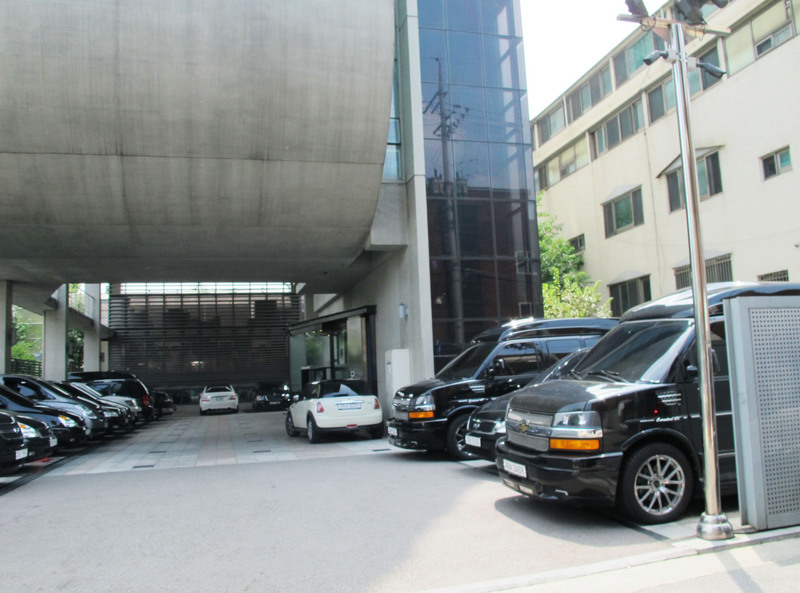 So my first goal is to see their company with my own two eyes, which is YG entertainment building. The coolest building in town. 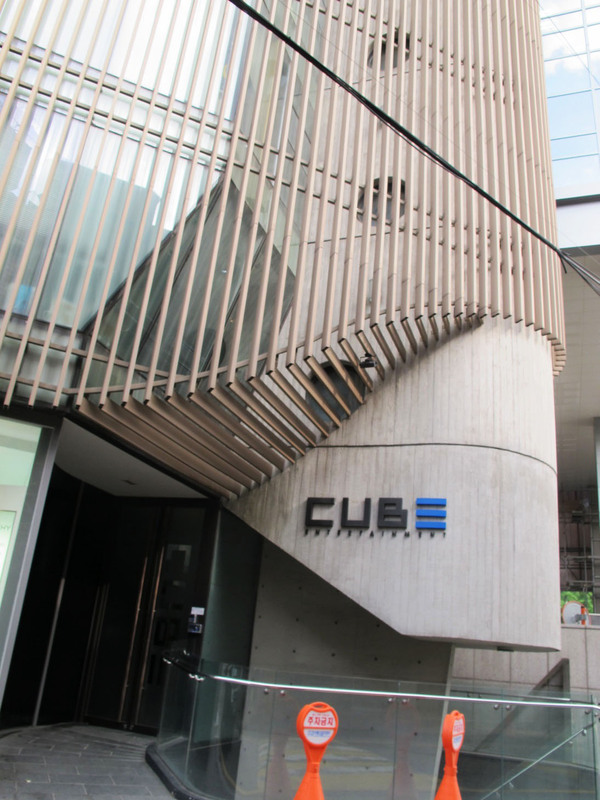 If you’re a kpop fan you see this building a lot in korean shows. 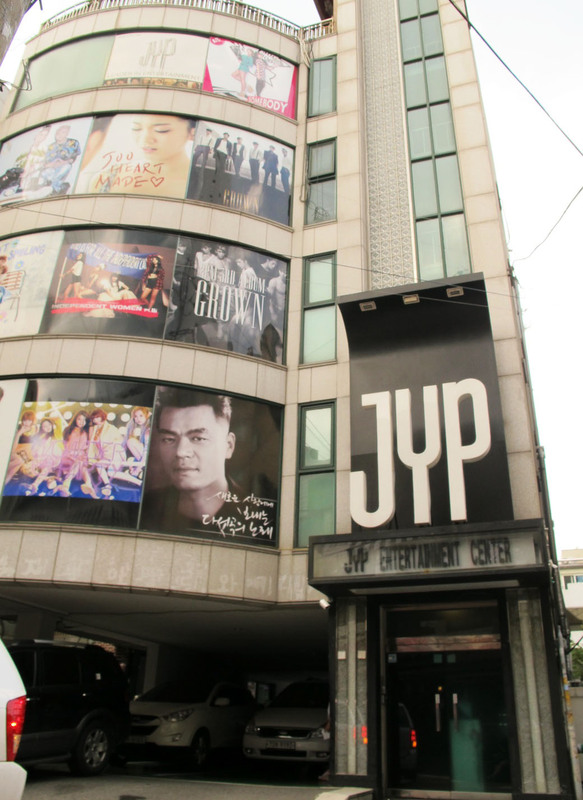 So me and my friends looked it up online on how to get to YG, SM and JYP. Our first stop was YG, it’s not that hard to find, if you find the directions online and follow them exactly. You’ll easily find this building. 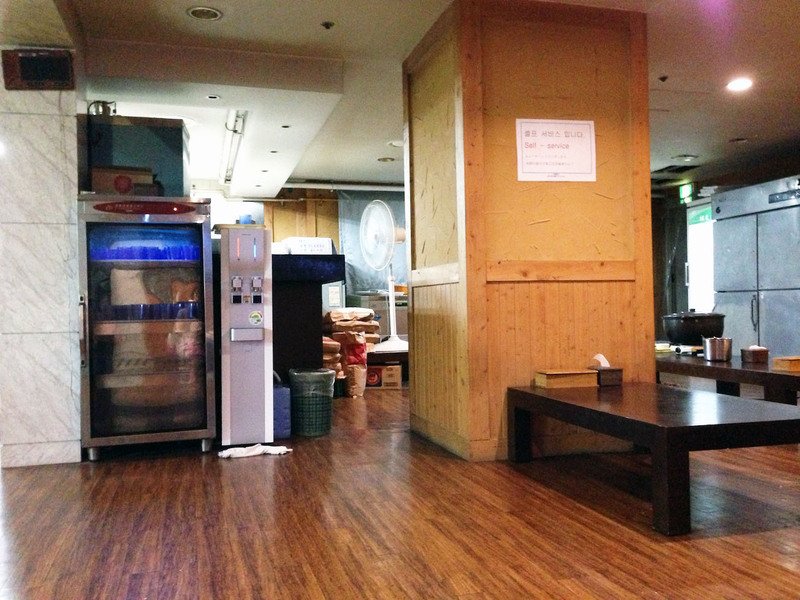 In front of YG there’s a small cafe and a 711 store where you can find the GD’s version of glaceau water. We only stayed around an hour here, because we didn’t have much time, so after we took a couple of photos we go straight to our 2nd destination, SM Entertainment. SM is located in Gangnam area, if i’m not mistaken it’s in apgujeong-dong. The building is right in front of tory burch. It is much easier to find than YG. because it’s located on the main road. Not so far from SM you can walk to JYP. Well, It’s not really that close, but it’s not far either. You can look it up online for the directions. 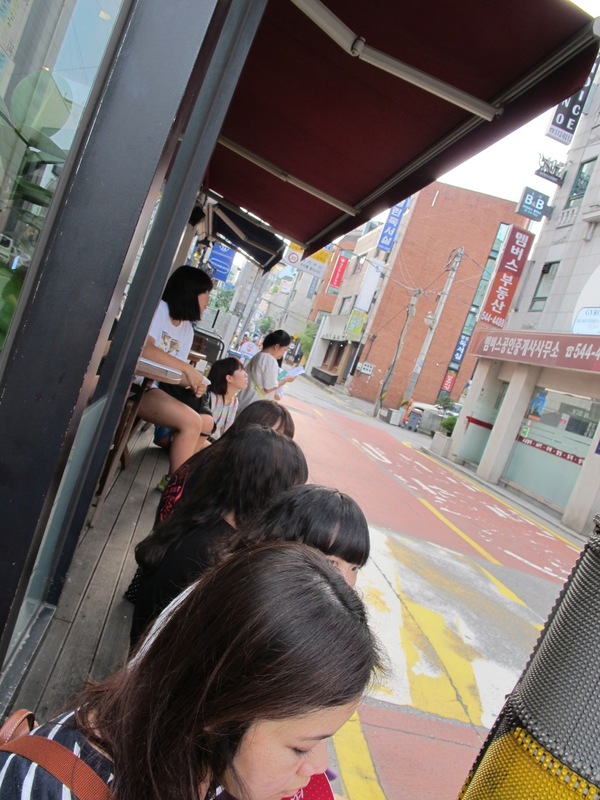 In front of JYP there’s a dunkin donut store. When I was there, there are some girls waited in front of the building, they said that taecyeon from 2pm is going out, so they waited there for hours. On our way to the subway station, in apgujeong. we saw lee seung hoon in front of our eyes, he was walking with his friends and passing me and my friends. he’s not yet famous tho, but for people who watched kpop star season 1 will definitely know who he is, he’s a rapper and currently a trainee in YG (just found out that when i saw him that day, he was walking with his friends which i think is TEAM A from korean tv show WIN, they were walking towards a famous salon that korean celebrities usually go to) now i’m just full of regrets, i should’ve ask to take a photo with him at least. shhhhh….. well, my conclusion is, if you want to see famous people wandering around the street, go to apgujeong-dong or cheongdam-dong. 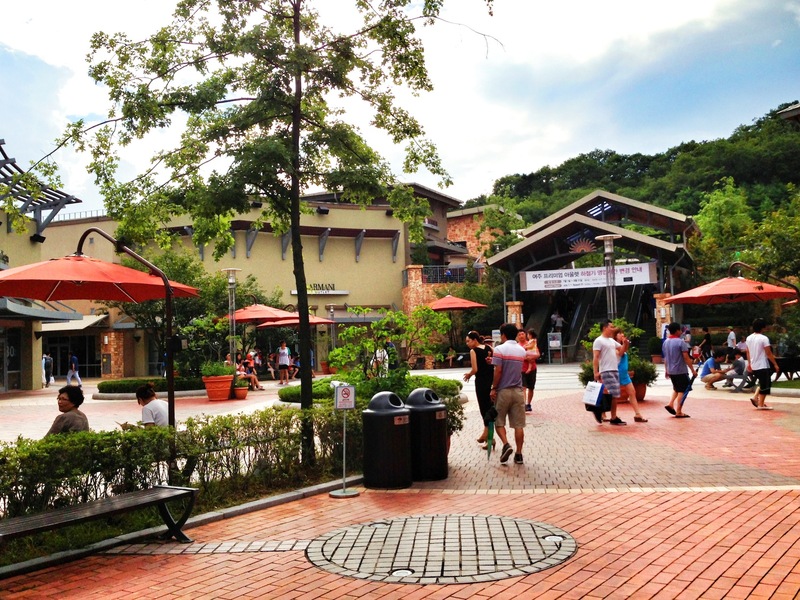 Yeoju Premium Outlets is Korea’s first premium designer outlet. It is located in gyeonggi-do. If you are into branded, luxury goods, than this is a good place for you to shop. 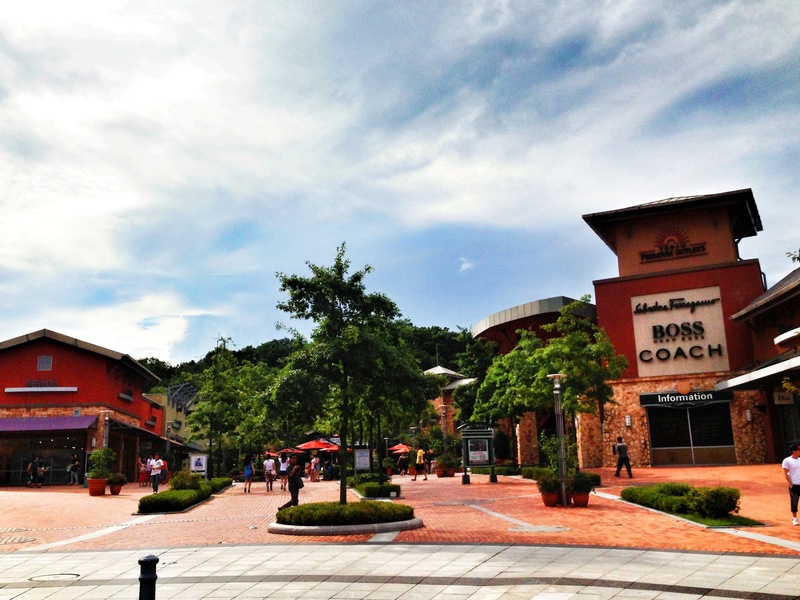 But for me there’s nothing special about this premium outlet. For myself, when i’m traveling, I was never into branded goods, so a few hours here was more than enough for me. the only thing that fascinates me is the huge nike store. Korean love wearing sneakers, so nike, adidas, NB, etc are very famous here. and it’s cheap either. We took a subway to Express Bus Terminal station, hopped onto an express bus headed for Yeoju. The buses depart every 30 minutes. There at the bus stop in Yeoju, we took a taxi to the outlet. Hmm i don’t really recommend this place, the brand and the stuff are just so-so. This place is super famous among tourist, especially couples. you’ll see a safety fence that’s covered in thousands of padlocks. These curious objects are symbols of love fastened by young couples. If you come here, make sure to bring your own lock because they don’t sell them there. In there you can see many people wearing couple shirt or couple anything. I didn’t go to the top of the tower that day, because it was raining and foggy. 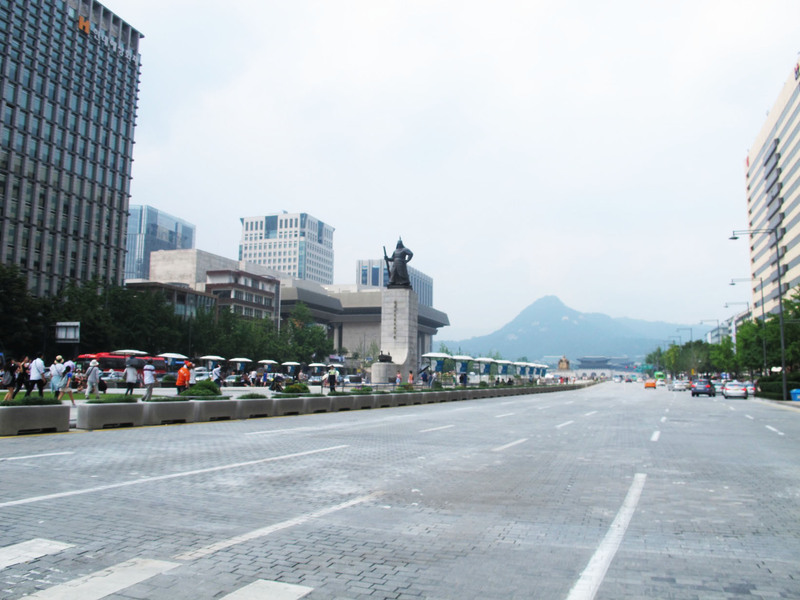 This place is quite symbolic, and it’s now the famous landmark in Seoul. Located on front of gyeongbokgung palace, the palace from the joseon dynasty. The atmosphere here is really nice, you can see how beautiful korea is, the view is crazy beautiful and you can see kids playing with the fountain here. You can see two statues here, one is King Sejong, King Sejong accomplished renaissance of Joseon dynasty by developing hangeul (korean alphabet), science technology, culture and art. if i’m not mistaken he’s the 3rd king of the joseon dynasty. Carribean bay is probably one of the biggest water parks in the world, We spend our last day here in carribean bay. The most famous water park in Korea. The ticket price is pretty expensive, it’s $70, but if you come here early, with that ticket, you can go to both carribean bay and everland park. So for 2 parks, i think the price is definitely worth it. Unfortunately, me and my friends came very late that day, around 4pm. So we can only choose 1 park. 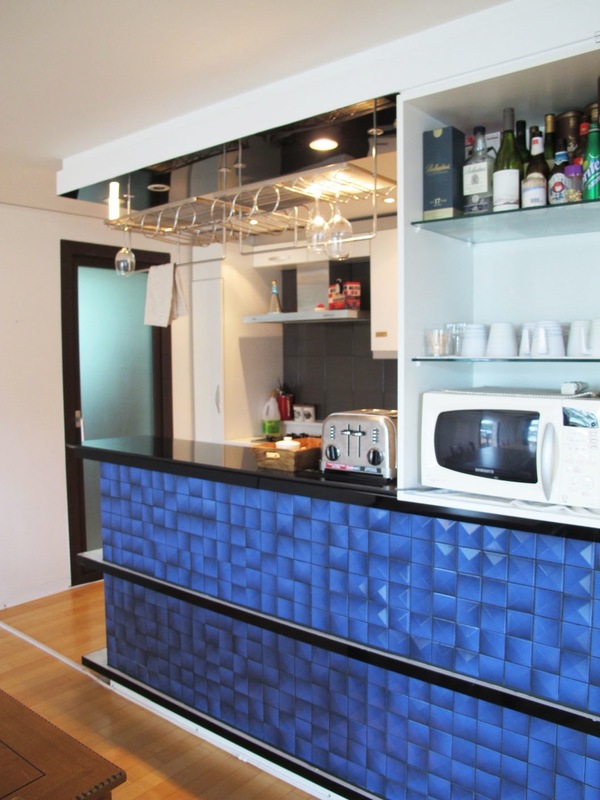 In here, guests can enjoy swimming and water amusement rides or relax in the hot spring waters. Caribbean Bay has various facilities, such as the indoor and outdoor pools, spa, sauna, wave pool, and slides. Most of the slides in carribean bay close at 10pm. So eventho me and my friends came very late, we were able to try most of the slides. The funniest thing for a foreigner that goes to a Korean water park is probably the way girls dress for this kind of occasion. Interestingly enough, Girls do wear bikinis here, but they are hidden underneath those long sleeve t-shirts (to protect from the sunlight, as tanned bodies are not fashionable at all here). It is also important to make use of a cap or sunglasses to protect your face from the evil sun. I didn’t take any photos of the park, but you can look them up on youtube to see what they offer. Subway is the best way to get around Seoul. Korean people are nice, if you’re lost or need help for something, ask them politely, they’ll help you. Koreans are crazy with their smartphones. In the subway you can see 98% of them looking at their smartphones, they’re updating their status, chatting, checking out instagram and path, texting, reading, and even watching tv. It is crazy, i’ve never seen anything like that in my life. But i like it tho, they are so busy with themselves they don’t disturb other people like here in Indonesia. As i’ve mentioned in my previous post about Korea before, the food there is not that cheap (even the street food). Don’t worry, everything is definitely worth the price, one word, DELICIOUS!!!! food heaven!!!! 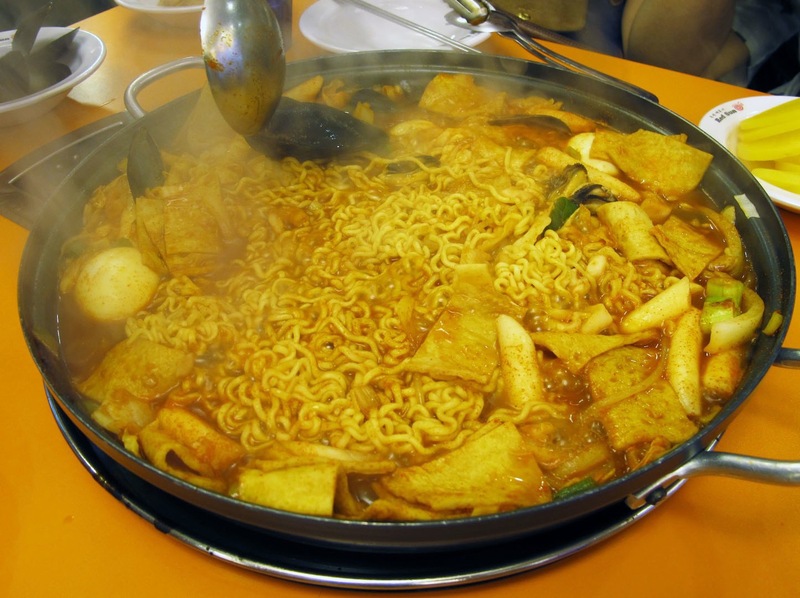 (i’m a korean food lover :p ) but really, you will love it! Well, hope this post will help you on your journey. I think myeongdong is better, there’s a lot of food (less expesive than gangnam) and if there’s anything you want to buy you can just walk to myeongdong. And it is also located very close to the seoul tower. You just have to make sure that you stay near the subway, so it’s easy for you to get around.